Teaching With Love and Laughter: Teaching Tip Link-up! I'm linking up with Miss Kindergarten! She's having a teaching tip linky party! My tip is how to handle unfinished work. 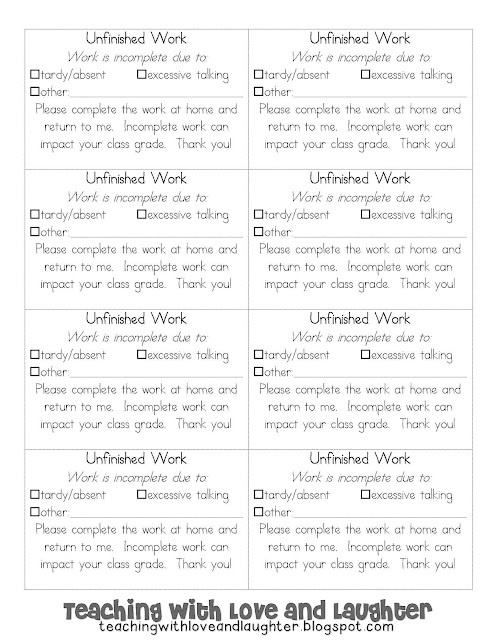 When my students don't finish their work, whether it be due to an absence or tardy, or, the dreaded, excessive talking or lack of focus, I staple or clip a little note to it, explaining to the parents that the work needs to be completed at home. The note also tells the parents why the work was not completed at school. There's even a spot to write in a reason. I made the notes tiny, so I could fit a lot of them on one page, to save paper and copies. These notes have saved me lots of time. Now, I don't have to keep writing notes home for the same reason. I always have a supply on hand and when a student is absent, I automatically attach the note to the work and put it in the child's mailbox. If you would like to use my notes, just click on the image below. Or, you can always make your own that is specific to your needs. Mine actually have my name on it. My pleasure! I've already stuffed red and green paper in my page protectors. I'm ready to implement your super idea! Ooh, I love this! Thank you! How did you know that I needed this? I have been having a lot of trouble with this lately! I love it! Thanks! I am your newest follower! A little birdie told me! I'm glad you like it, Hilary! Welcome to my blog! Hello, Jackie and Danielle! I'm glad you like it! Love it!! I used to have something similar but I seriously forgot all about it. Guess what I'll be printing on Tuesday?? Thank you so much!!! This is wonderful!! I love this, especially with an excuse for excessive talking. Thank you so much! This is a fantastic way to do this. I have my kids put all their unfinished work in a folder and then end up doing it before they can have play time. If it isn't finished by the end of the day they have to take it home and do it. Love the idea of a little friendly reminder note each time. Lori, what a great idea on non-finishers. This will save me a huge amount of time!! Thank you. Link says it is not there. Is this still available?? I fixed it! Try again!